Many of us know of the health benefits of taking turmeric, in moderation, as part of our daily routine but have you ever considered that it can also be good for your hairy friend? 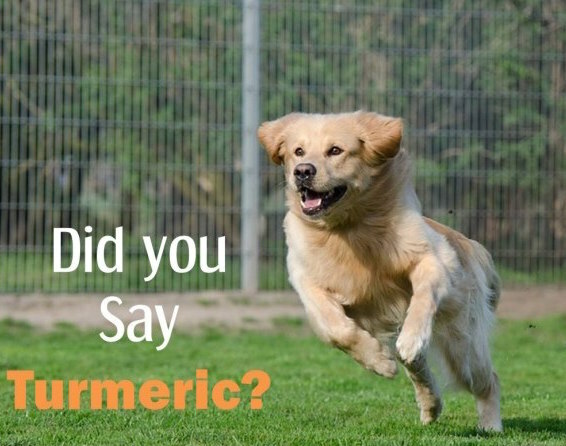 Yes, even dogs can benefit from a daily dose of turmeric in their diet and it certainly won’t harm them! With all these possible benefits, turmeric truly is a wonder-herb! Many dogs, particularly older ones, suffer from joint diseases such as hip dysplasia and arthritis. Turmeric’s anti-inflammatory properties can significantly help to reduce the symptoms and give pain relief. Studies have also shown that cancers, allergies, dental disease, digestive disease and more can be treated with the herb, which helps the immune system to heal the body by increasing the number of white blood corpuscles. It has also been shown to effectively shut down the blood vessels that feed cancer and can also help to shrink and kill the cancer cells. Turmeric is extremely beneficial for dogs as well as humans, but, like everything else, too much of it can be bad for your health so you need to be aware of the possible side-effects and take the necessary precautions. If your dog is on blood-thinning medication, be careful as turmeric is a natural blood thinner and too much could cause internal bleeding. ALWAYS consult your vet if in doubt! In any event, the best way is to start with small doses, as little as a quarter of a teaspoon daily mixed in with his food until you begin to see results and then increase slowly until you reach the optimum dosage. If your dog becomes nauseous, constipated or excessively hot then he, or she, may not be a suitable candidate for turmeric therapy. Also, turmeric and aspirin should not be taken together so do not give both of these at the same time. Warm the turmeric powder, water, and coconut oil in a pan on a low heat until it thickens. Add the black pepper when cooked and extra water if too thick. Allow cooling. The paste can be stored for up to a month in your refrigerator. Mix a small teaspoonful with your dog’s normal food on a daily basis and increase gradually depending on the results. The maximum recommended dose for larger dogs is one teaspoon daily.